Catalan separatist leader Carles Puigdemont left Finland before authorities could act on a Spanish arrest warrant, a Finnish MP says. Mikko Karna said Mr Puigdemont had confirmed he had arrived in Belgium.The warrant was issued on Friday, a day after Mr Puigdemont arrived in Finland. He was due to leave on Saturday. The ex-leader has been living in self-imposed exile in Belgium since last October’s banned referendum that backed Catalonia’s unilateral secession bid. Finnish daily Helsingin Sanomat quoted an official from the National Bureau of Investigation as saying the authorities were unaware of Mr Puigdemont’s whereabouts. Tensions in Catalonia are very high and its separatist leaders have abandoned plans to name a new president following the arrest of the latest candidate. Crowds of protesters clashed with police in Catalonia on Friday night after Spain’s Supreme Court ruled 25 Catalan leaders should be tried for rebellion, embezzlement or disobeying the state. Convictions could result in up to 30 years in prison. All deny the allegations. One of five people taken into custody on Friday was Jordi Turull. 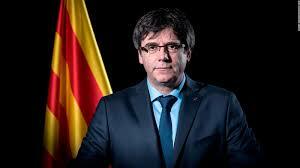 He was to have been the subject of a vote in the Catalan parliament on Saturday. Other separatist figures are already in custody or have gone into exile abroad. Friday’s rulings at the Supreme Court in Madrid were considered the most serious challenge to date to the Catalan independence movement. Almost the entire leadership now faces a major legal fight. All five spent some time in detention following the banned referendum but were released on bail late last year pending investigations into their individual roles in the vote. In his 70-page ruling, Supreme Court Judge Pablo Llarena said that they should be returned to jail as they represented a flight risk. He did not set a date for their trial. The five join four other Catalan leaders already in prison. They include Oriol Junqueras, the former Catalan vice-president, and Jordi Sánchez, who was nominated to lead the Catalan government but dropped the bid after the Spanish authorities refused to release him to attend an investiture ceremony. Judge Llarena also issued an arrest warrant for Marta Rovira, the deputy head of the separatist Esquerra Republicana party, who failed to appear in court on Friday. It later emerged that she had fled into exile and Spanish media reported that she was in Switzerland. In a setback for the pro-independence cause, a survey published by the Catalan Centre for Opinion Studies recently suggested support for independence had dropped sharply, with 53.9% of Catalans now against the idea and 40.8% saying they were in favour. Mr Puigdemont, himself, recently said a majority of Catalans might support Swiss-style federal autonomy, rather than full independence.